Dry roast the peppercorns, fennel seeds and cumin seeds and grind along with coconut and onions and make a fine paste. Heat a wide kadai with both the oil . Do the seasoning with fennel seeds and curry leaves. Add the chopped onions and scald well for a minute. Drop in the GG paste and saute until it starts sticking. Add the salt while adding onions. Throw in the chopped tomatoes , cook until the tomatoes disintegrates. Now add the turmeric powder , red chilli powder ,coriander powder and saute for 30 seconds.Add the crab now and scald well. Pour in the tamarind mixture and add a cup of water. Let the kulambu boil for few minutes. Finally add theground paste in the boiling kulambu and mix well. Let the whole mixture be in the heat and let it boils for 5 to 10 minutes / until cooked. 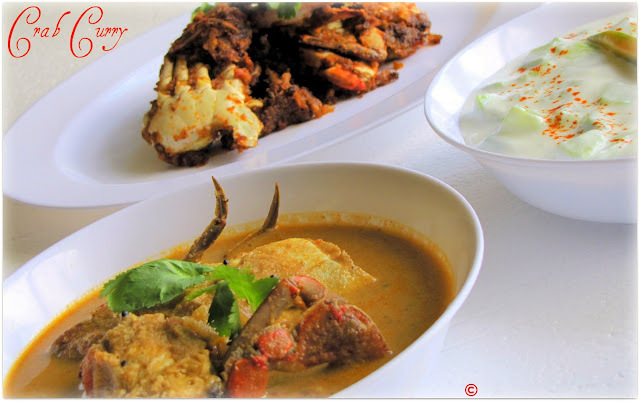 Serve hot with rice ..
Drooling crab curry.Lovely pictures di. Want to taste that really.. Looks stunning and yummylicious..
crab curry looks so inviting and delicious !! I miss this...tried it with alaskan crab...doesnt taste good like blue crab tho!....delicious curry!...looks yum! Delicious and spicy crab masala,your recipe sounds wonderful, delicious spread makes me hungry. Awesome crab curry.....and gr8 clicks.. I really love crab meat...will try this one for sure!!! Wow awesome. I love crab. Shld try this curry. Crab curry and fry looking delicious. 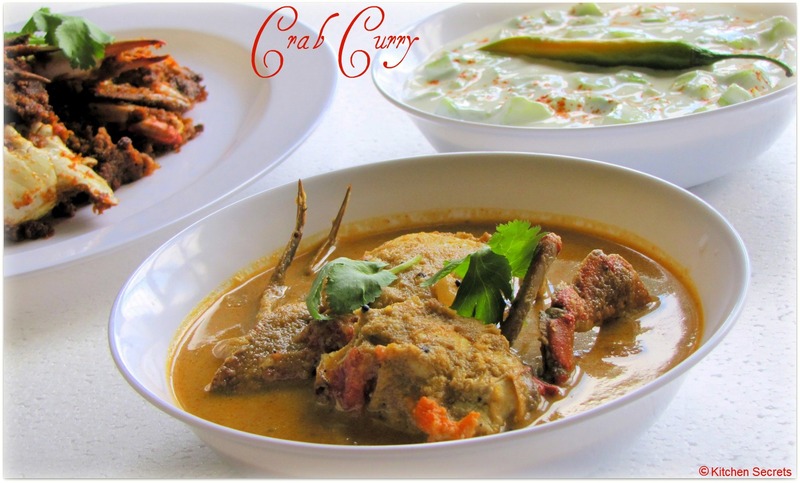 Seriously am drooling here dear, soooo inviting crab curry...makes me hungry..
Wow a spicy and authentic recipe!! I am here for first time, happy following your recipe..
wow...what a great looking crab curry ! there's an award galore waiting for you in my space...plz accept it ! Crab Curry looks awesome !!! aaaah.. one of my fav. I have never made nandu..got to do it now.. tht recipe is just so fab. Great presentation and looks tasty! Beautiful pics..Looks so perfect n yumm!! !